World River Day was proposed by Mark Angelo, a resident of Burnaby, Canada after the declaration of the Water for Life decade in 2005 by the United Nations. Mark Angelo is an internationally recognized river conservationist whose life and work is dedicated to protecting rivers and the aquatic organisms that inhabit them. By establishing a day drawing attention to the rivers of the world. The most commonly used water sources are rivers and lakes, which contain less than 0.01% of the world’s water! River water is an important surface water resource for households, agriculture (e.g. irrigation, animal husbandry) and industry (e.g. processing water and energy production). Moreover, rivers also provide many ecosystem services that lead to tourism. River water quantity and quality strongly depend on its runoff system, the seasonal changes and the general soil and vegetation it flows through on its way to the sea. (Rivers by Beat Stauffer seecon international gmbh & Dorothee Spuhler seecon international gmbh). Research and studies of such ecosystems have proved that trees are not just ideal but crucial to support rivers and mitigate disasters. The Arbor Day Foundation has put together a paper on the need for trees to strengthen riparian ecosystems. According to the Foundation shading creeks and rivers help keep the water cool. Cool water carries more oxygen and provides a more liveable environment for many species of wildlife, including game fish such as trout. The warmer water of denuded creeks also slightly increases the release rate of certain pollutants from sediment particles. When trees, shrubs and other plants cover a stream’s floodplain, they slow the rush of high water. Since fast-moving water can carry a higher amount of soil particles than slower water, sediments are dropped by the flood waters in the riparian zone rather than ending up downstream in reservoirs, channels, and harbours. Slowing the water also helps to reduce streambank erosion. The Arbor Day foundation has also found that riparian zones with trees and other vegetation filter excessive chemicals that wash from lawns, gardens, and fields. 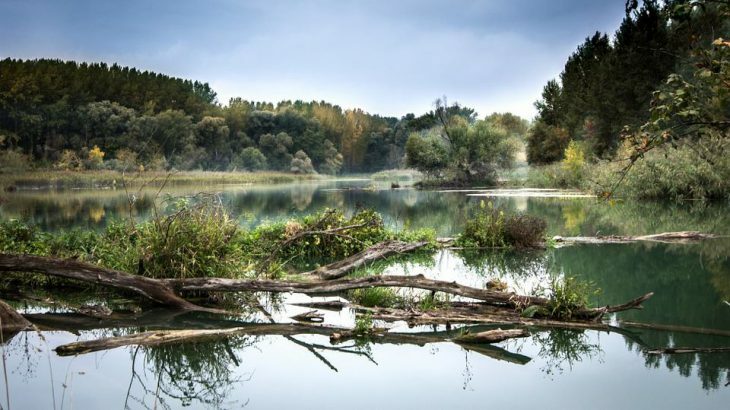 In some cases, such as phosphates that cling to soil particles and move downslope in runoff water, the soft soil and leaf litter of the riparian zone act as a trap for the particles and associated chemicals. The phosphates stay on-site, absorbed into the soil from which they are taken up by tree roots. Nitrates move either on the surface or in groundwater. These chemicals, too, can be intercepted and used by tree roots rather than being allowed to enter the waterway as pollution. Even pesticides are transformed into non-toxic compounds in a riparian woodland. The unsustainable use of rivers for human industry is resulting in rivers filled with pollutants making it unfit for the sustenance of aquatic life and unsuitable for human consumption. The loss of tree cover around river banks is depriving the riverine ecosystem of its natural filtration system. Trees help keep the soil porous, allowing the quicker percolation of water boosting groundwater recharge. Studies have found, that even though trees absorb water from the ground, regions with no trees still accumulated less groundwater than a region with native species of trees. Over time the groundwater thus accumulated seeps into rivers, replenishing during lean monsoons and brutal summers. Trees are an important part of the earth’s hydrological cycle. The process of evapotranspiration from trees is responsible for supplying moisture to the atmosphere. Trees also help mitigate flooding disasters due to heavy rains by reducing the impact of overflowing water on the river banks and the soil. Trees are responsible for maintaining balanced, healthy landscapes that can moderate the effects of drastic weather changes. Rivers are water bodies that experience to tremendous turmoil as they meander through varying landscapes, go through different seasons and are subject to infrastructure projects that take a toll on their capacity to support life and hold water. Aiding the conservation of rivers via human intervention has become crucial to prevent a scenario where the world’s most significant freshwater source is reduced to the point of complete depletion. Conservation, Environment, Green Habits, Nature, Ofsetting Carbon, Uncategorized. permalink.